There are a few people in my circle who have or had throat and neck cancers. As these are more rare forms of cancer, help and support is often not readily available. By knowing these people, I have come to understand some of their challenges. One of the main problems as a result of treatment is no saliva and the resulting issues around eating – even the enjoyment of eating such as lack of taste. Saliva is something we take for granted in the eating process. When it is absent, food is not easily chewed, absorbed or transported. It needs to be soft, wet and a milky consistency in order to facilitate swallowing. Even exercise is a challenge as dry mouth sets in. Having a ready water supply is absolutely necessary. Dry mouth products are available to help counter some of these problems. 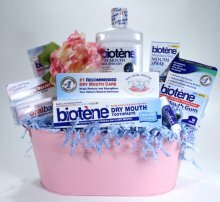 Although not inspirational gifts for cancer patients with head and throat cancer, a gift basket of these products for dry mouth might be a very welcome and helpful gesture of caring and concern. ← What Are You Putting On Your Skin?